It breaks our hearts to turn any kitty away, but sometimes it is simply not possible to make any exceptions when there are no foster families, or when the Program is full. So we are trying to make a difference in offering a unique service only available locally through Puffy Paws Kitty Haven. Its called our Courtesy Posting Program. If we are full and do not have any foster families available, you can send us a picture and a bio of the kitty or kitties that you need tofind a forever home for and Puffy Paws Kitty Haven will put them on the kittiies facebook page for folks to consider for adoption. You must be aware and obey the local laws in your community regarding the transfer, sale or adoption of a cat. Puffy Paws Kitty Haven is not legally responsible for any transactions between the adoptee and adopter. Please be aware that these kitties have not been inspected by anyone at Puffy Paws Kitty Haven. You must contact the family directly. We strongly advise taking the kitty to your vet right away or asking for proof of shots, neuter or spay prior to adopting. 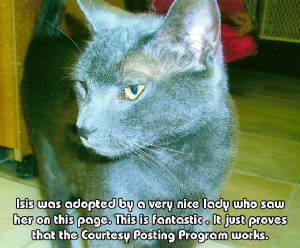 By adopting a kitty from this page you really are saving a life.